Note: The blog post originally appeared at E-International Relations on 23 August 2016. The original post can be found at: http://www.e-ir.info/2016/08/23/commercialized-nationalism-on-display-at-the-olympics/. With the closing of the Games of the XXXI Olympiad in Rio de Janeiro, it is both timely and pertinent to reflect on the power of national image through the medium of sport. Every four years, the Olympics provides the most visible stage for the televisual performance of national identity, while at the same time, creating conditions for the throaty expression of nationalism back at home. While no war will be ended at the games, nor will any treaty be signed, the chance for countries to go head-to-head on a (purportedly) level playing field is a unique experience, comparable only to the World Cup. At the games, dedicated men and women compete for the glory of their homeland, typically clothed in the colours of their nation, while their countrymen cheer them on often waving flags as ‘proof’ of their loyalty. In this highly choreographed and purposefully affective environment, nationalism is the coin of the realm. With nearly 11,000 athletes representing more than 200 countries and watched by billions around the world, this spectacle is the most effectively mediated form of international relations possible, putting to shame the United Nations General Assembly or any ‘real world’ geopolitical event. Certainly scholars have long recognized the Olympics qua an international competition as an important adjunct to IR and geopolitics; however, in this post I want to focus on another aspect of the games: TV commercials. Two advertisements in particular caught my eye this year, each showcasing American nationalism against the backdrop of the Olympic Games, which, incidentally, saw Team U.S.A. take home more medals than in any time since the Soviet-bloc boycotted games in 1984. Adding to the euphoria was the realization that the U.S. became first national team to crack the 1,000-medal mark in the history of the modern games, more than doubling the count of its nearest competitor (in all fairness, the U.S. was helped to win their 121 medals by the absence of a sizeable portion of the Russian team, banned from competition as punishment for state-sanctioned doping during the winter games held in Sochi, Russia, two years prior). The first of these advertisements was for the Samsung Galaxy Note 7. Billed as the ‘sexiest large-screen phone ever’, this stylus-enabled device sells for upwards of $1,000 USD. In the commercial, Austrian actor Christoph Waltz assumes a variety of personae, beginning with that of an effete European gentleman sitting in a well-appointed study overlooking the Alps where he is taking high tea. ‘Americans’, he sniffs, ‘I don’t understand you. Always working all the time: busy, busy, busy’. He then dismissively draws the viewers’ attention to the mobile phone is his hand, lamenting that now ‘we’ can do ‘even more’ (work, that is). The visual narrative then shifts, with Waltz in ethnic drag (and, in one case, actually drag as well) portraying a variety of ‘stereotypical’ upwardly-mobile Americans: a new mum on a stationary bike with her infant strapped to her chest in a BabyBjörn so she can update her Facebook profile photo; a dreadlocked vacationer in a tropical waterfall using the phone to stay in touch with the office; a plaid-clad everyman using the handset’s Bluetooth to buy a giant fountain at a Home Depot stand-in; and a high schooler winning the robotics challenge due to the ‘extra curriculum’ supposedly abetted by the device. Making a direct reference to supposedly ‘lazy’ Europeans, he states, ‘You get more done before 8:00AM than the rest of the world and we are hours ahead of you’, before going on to tell ‘us/U.S.’ that ‘You’re never happy just winning something…you’re only happy winning everything’. In the third act of the commercial, which showcases the ‘greatest most influential nation’ in the world’s ‘tireless ambition’, Waltz assumes the visages of iconic American patriots, from George Washington to Abraham Lincoln to astronaut James B. Irwin, before realizing that his (materialistic) dreams can also come true. All he needs is to become a hard-working American (visually realized with the closing shot of his blond, preppy family in front of a McMansion draped in the stars-and-stripes). And how does he do this? Of course, with his hard-working mobile phone. In his meticulous, urbane, and seemingly care-free existence, Waltz presents an American-viewing audience with the epitome of continental Europeanness. But the lesson learned here is that despite our transatlantic neighbours’ seeming happiness achieved through an appropriate work-life balance, they all just want to become Americans at the end of the day. The advertisement is curious on multiple levels. First, is the casting of Waltz, who is most-known for playing savagely racist characters like SS-Standartenführer Hans Landa in Inglourious Basterds (2009) and the real-life Belgian colonist, who served as inspiration for ‘Kurtz’ in Heart of Darkness, Léon Rom in The Legend of Tarzan (2016). Beyond Waltz’s filmic associations with the darkest manifestations of Social Darwinism, the politics of race are (inadvertently) on display throughout the commercial, whether via Waltz’s ‘white Rasta’ pantomime or the Aryanesque patriarchal domesticity of the achieved ‘American dream’ (white plantation-style home, blonde wife, blond kids, yellow Labrador Retriever). Second, the notion that South Korea’s largest chaebol is the driving force behind American ‘success’ fails to pass the red-face test when placed in context. Although Samsung, with its over-the-top (American) nationalist chest-thumping, has actually outdone Cadillac, which in its commercial for the 2014 ELR Coupe, struck a similar chord. The latter ad, widely-condemned for both its jingoism and elitism, denounced ‘other countries’ (specifically France, as evidenced by a sly ‘n’est-ce pas’ at the end of the ad) for ‘taking the whole month of August off’ (and which made a similar reference to the lunar roving vehicle as interplanetary evidence of American ‘success’). The other commercial that underscored the Olympian extravaganza as the optimal zone for engaging in national-identity building was an extended version of Budweiser’s rebranding campaign. In the summer of 2016, the fourth-most popular beer in the country officially changed its name to ‘America’. Given that this temporary departure in nomenclature explicitly occurred as part of the 2016 presidential campaign, the framing of the name-change through the summertime medium of the Olympics should be of no surprise. 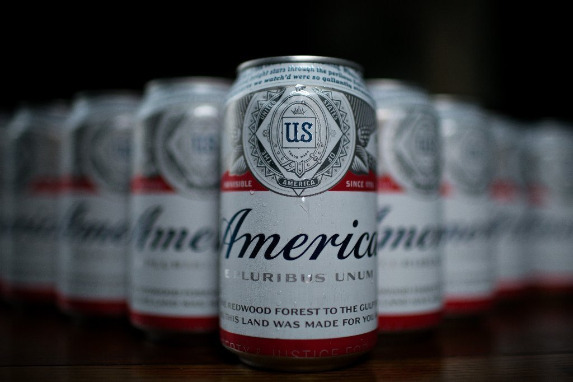 Importantly, Budweiser has stated it will revert to original product name after the November election and that the redesign, which includes the national motto E pluribus unum, is meant to ‘inspire drinkers to celebrate America and Budweiser’s shared values of freedom and authenticity’. Coming from Budweiser, a company that began by pilfering its name and style from the Bohemian brewery Budvar, and is now owned by the Belgian-Brazilian conglomerate Anheuser-Busch InBev, the notions of ‘authenticity’ and ‘Americanness’ are equally suspect. However, unlike the almost unbearable whiteness of the Samsung commercial, the Budweiser TV spot is at pains to sculpt a multiracial America, where block-parties and low-income jobs contrast sharply with the Waltzian U.S.A. of über-pampered and propertied elites (also of note, the Bud ad also includes footage of athletes, thus linking the medium to the message). In these duelling depictions of the American dream, we are witness to two very different versions of America, which strangely parallel the narratives of presidential candidates Donald Trump and Hillary Clinton. The Samsung commercial portrays an America of intellectual labour, white privilege, and vertiginous wealth, ‘made great’ by behaviours and habits that reflect Trump’s now infamous conflation of ‘sacrifice’ and ‘success’. Whereas, the Budweiser-imagined realm presents an America defined by faces of many colours, a people bound together by manual labour, hard knocks, and not-to-be-taken-for-granted moments of camaraderie. The Samsung ad begins by looking at America as a ‘negative’, but in the end resolves that with the ‘right’ attitude (complemented by accumulation, wealth, and whiteness), it can be the best in the world; in other words, a highly contingent form of patriotism. Alternatively, the Bud commercial revels in an everyday America, a nation that already is great and not something that needs to be changed. Herein we see an organic and unequivocal patriotism, much like the one that was (somewhat surprisingly) on display at the Democratic National Convention in Philadelphia, Pennsylvania. The Olympics are over, but the U.S. is just beginning to wrangle over which form of banal nationalism it prefers: the (un)American dream of Christoph Waltz as an immigrant Trump wanna-be, or the workaday reality of a patchwork nation downing cans of ‘America’. Whichever direction the country decides to go, it should not be overlooked that giant overseas corporations (dutifully supported by local advertising agencies) are taking an increasingly important role in telling Americans exactly who they are.